I’ve been as sick as a dog over the past two weeks so there have been no visits to Floraide as yet. What I have been enjoying are the bulbs I’ve been growing in my own garden. Indeed staggering outside for a few minutes a day is about all I’ve managed recently. I’m very excited to see that my tulips are flowering. Strange how I like them in small dollops – when the massed displays only bring out curmudeonly grumbling from me. I’ve been waiting for months to see how my muscari would look in the blue bonsai bowl I picked up from the tip shop. Pretty good I think, with better to come. And last a massed display of ixias. These were growing naturalised under my Japanese maple, but have now been transplanted as the veggies have encroached ever further into the rest of the yard. I realised in assembling these photos that there is another unifying theme here. The plants are all displayed in pots we made at our ceramics class. Not great art, but certainly something unique to our garden! 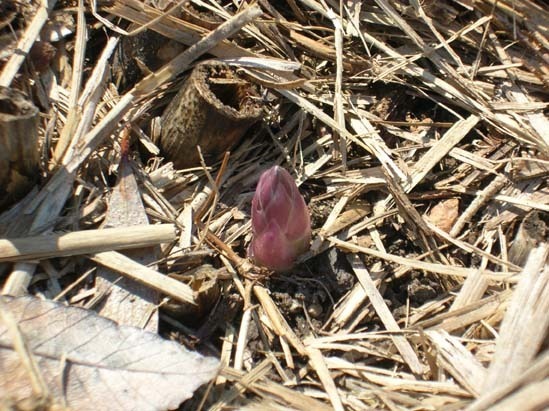 Each day we walk around the garden looking for the signs of new season’s growth. It doesn’t matter how many times you see plants popping above the ground in spring it’s still an amazing feeling. Purple sprouting broccoli, appearing much earlier than they did last year, due in part to earlier planting and a warmer spot in the front garden. Well its not often that firing a black powder gun is a requirement for gardening but there are always new things to explore. But before long we all had to gather our our musical instruments and pots and pans and make our way down to the old apple tree where the ceremony was to take place. 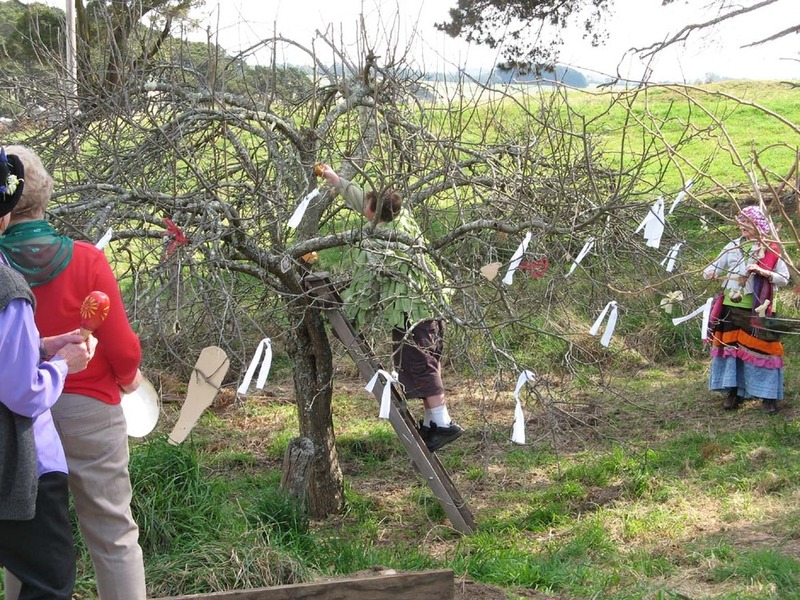 Bread soaked in cider was placed onto the tree branches, while lots of noise was made to scare away evil spirits. While I’m not sure that the Anglo-Saxons used the vuvuzela in their original wassailing ceremony it certainly added to the sound effects. On a gentler note the tree was also tickled awake with a bunch of feathers. The assembled crowd recited the toast to the old apple tree “Here’s to thee old apple tree, that blooms well, bears well. Hats full, caps, full, three bushel bags full. An’ all under one tree, Hip, Hip Hooray!” After which the gun was fired. We had a great time at Reidsdale and I see from the website that there are many other activities scheduled over the coming months. We certainly plan to visit again and hopefully take advantage of their cider pressing service when we go apple scrumping next year. Back at Chez Fork I think its more than the apple trees that we need to wake up – now where’s that gun when you need it? 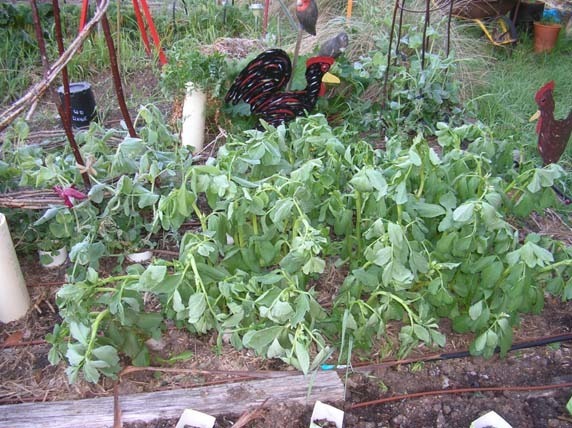 The first thing that Lolo Houbein says in her book One Magic Square is that if you want to start a veggie garden you should put her book down immediately and go outside and dig up one square metre of ground. This is good advice particularly for people wanting to start new gardens in Canberra at this time of year. My last post was a quick caution about the air temperature, but its the ground temperature that is the biggest block to getting a new garden happening now. The ground is just too cold. 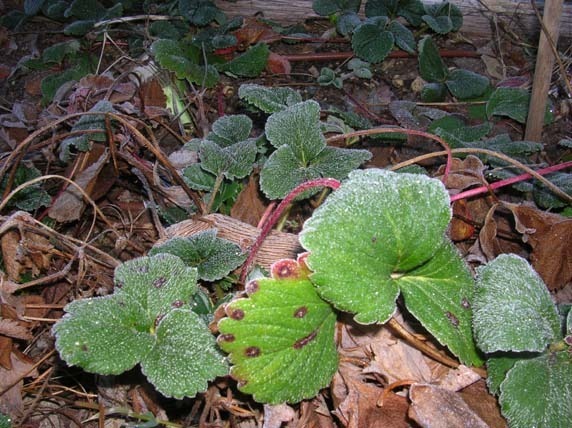 Many of the plants that you may want to plant just will not go anywhere until the soil gets a bit warmer. As beginner gardeners we fell right into the trap of planting too early. Our plants sulked and were targetted by every pest that came on by. But don’t give up there are some exceptions which I will cover off further down this post. 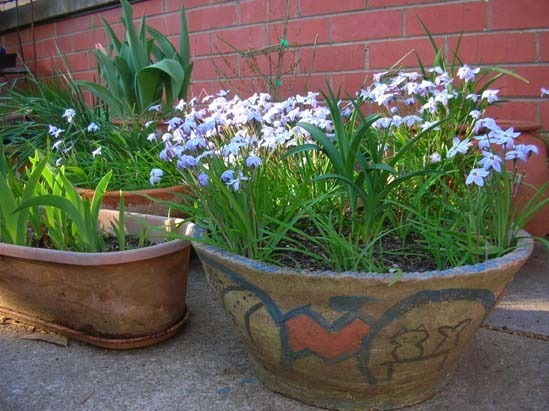 In Canberra October is the month where you can really get your main plantings underway. So better to harness all those spring urges and get down to the basics of getting your soil ready for your new garden. It really is as simple as getting out with a spade or garden fork and getting stuck in. If you are a complete beginner then Lolo’s advice to just dig up one square metre of soil is excellent advice. You want to keep your enthusiasm going without killing yourself or buggering up your back. Pull out the weeds and grass – these will compete with your plants so out they go – remove any rocks and break the soil up. You may read gardeners carrying on about digging to a fine tilth but frankly I think they should get over it! Unless you are making a bed for carrots, where you need very fine soil to avoid forked or distorted roots, most plants can cope with a few lumpy bits in the soil. If you are growing carrots or other root crops (parsnips, beetroot) you’ll need to dig your ground to about 30cms deep. Other vegetables need a good 20cms depth for their roots. Now get whatever compost, kitchen scraps, animal manure etc that you can lay your hands on and dig them into your soil. If you don’t have any of these just go down to your nursery or hardware store and buy some. While you are there get some sugarcane mulch or pea straw to put on top of the bed. Before sticking your mulch on give your garden bed a good water. You must be generous with your mulch, put at least 20cm on top of your garden, as you don’t want any weeds to grow through. Now you can leave this to get on by itself while you go and decide what to plant. Oh and don’t throw those weeds and grass out. Get a bucket or large container with a lid and throw all of your weeds and grass into it. Cover the lot with water and leave it for a month. Strain off the liquid and dilute it with water to the colour of weak tea and then use it as a plant fertiliser. Take the remaining sludgy stuff and stick it in your compost heap or dig it into your garden bed. Of course you may not want, or be able to dig so the ‘no-dig’ garden may be for you. 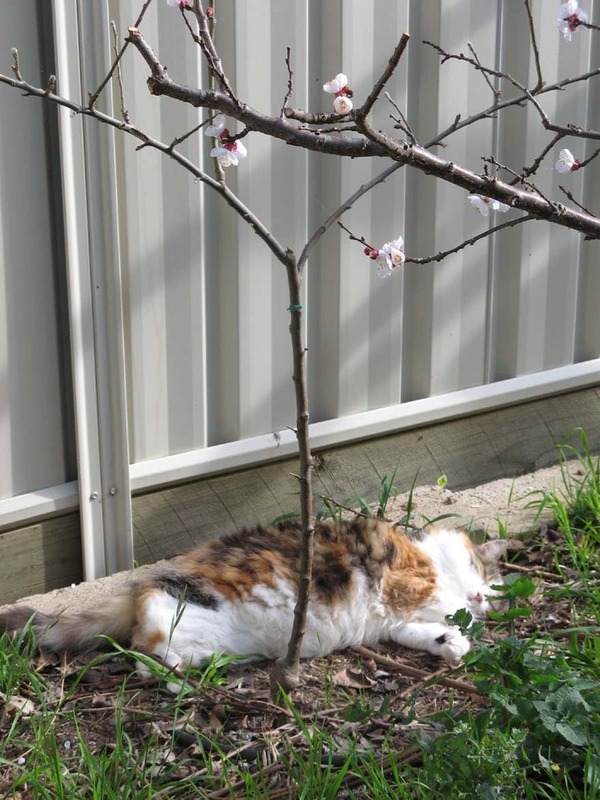 Here is Gardening Australia’s no-dig garden factsheet on how to go about this. PLANT: Potatoes, Jerusalem artichokes, globe artichokes, chives, rhubarb divisions and seedlings of cabbage, cauliflower, celery, broccoli, lettuce, silverbeet, spring long-keeping and salad onion and leeks. SOW DIRECT: Carrot, beetroot, parsnip, silverbeet, cabbage, cauliflower, broccoli, lettuce, onion, kohlrabi, summer spinach, leeks, swede, turnip, peas, Asian brassicas, Japanese turnip, peas. Under glass in containers sow tomatoes, pumpkin, zucchini and sweetcorn. So what are you waiting for, get digging! It’s 7.30 on Saturday morning and the third day of spring I’ve just gone out into the garden and this is what I see – frost. Yep, according to the weather station its minus 2 degrees out there. That is not a problem for my broad beans or strawberry runners but it is just too cold to start a lot of plants that the nursuries will be trying to flog you this weekend. So buyer beware please do not go and buy your tomato seedlings this weekend unless you have a nice warm space inside to start them off.